Here are the cars that stand best chance yet of changing every pre-conceived bias you ever had against Korean capability in the automotive arena. THE i30 N from Hyundai and the Stinger out Kia have won plaudit for being brilliant at delivering something rare out of South Korea: Dynamic brilliance, genuine character … in short, they’re actual driver’s cars. What makes them stand out? It certainly helps that, for both, Hyundai Group – parent of both brands – has allowed these projects to be subject to an open chequebook funding approach. However, the biggest difference to them being somewhat special also comes down to the talent of the engineers who oversaw their development all the way to the showroom. Top of them all, Albert Biermann, whose shift from BMW to a hugely well-resourced Korean car-making outfit with no performance car history sent seismic waves through the industry. Biermann is the man whose achievements before then included one of the world’s most successful and famous tin-top race cars, the E30 M3, the second-generation of the X5 and the cult classic 1 Series M Coupe, which emerged three years after he took over the M Division in 2008. So, what to make of these special K products. N is shorthand for two centres of excellence half a world apart. Design fell to Hyundai’s Namyang research and development facility in South Korea. Fettling occurred at another factory-operated skunkworks at the place renowned as the sign-off test for virtually all the world’s performance cars, the infamous Nurburgring Nordschliefe circuit in Germany. It takes very little time behind the wheel to determine which place has imprinted more powerfully: I’ve had enough past i30 wheel time to know it as a reasonably well-sorted car, but the ‘N’ is something else again. Clearly Korean by badge and elemental design, the performance edition is much less so by dynamic expression. Even though the base car also came out of the brand’s research and development centre in Germany, you simply get the sense this new flagship is all the more European in respect to how it delivers the goods. There’s a lot about the nuances of its driving demeanour that suggest stuff like the Ford Focus ST, Renault Megane RS and Volkswagen Golf GTi were used as barometers. And that’s no bad thing: Those cars are the drive enjoyment frontrunners in this category. So that,s good. What’s bad? Really, just one biggie. 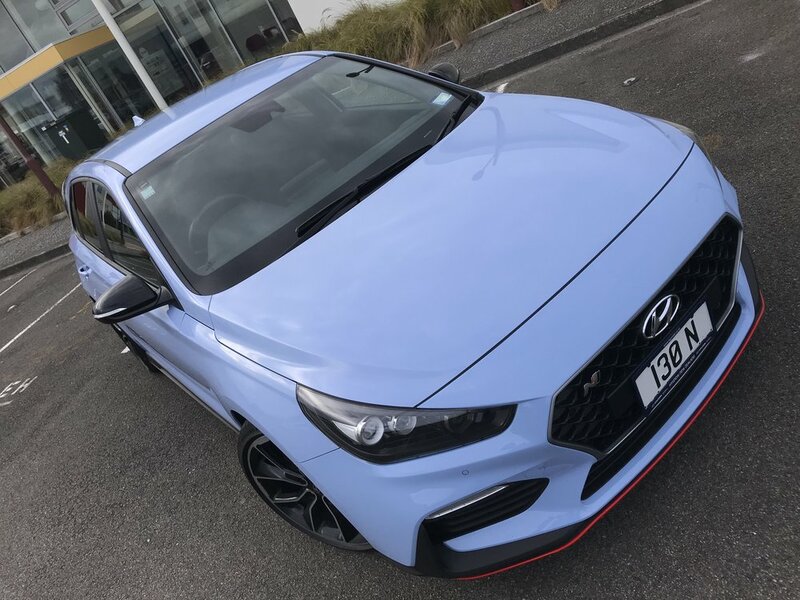 Hyundai has been made clear that the N family will broaden considerably over time but, as things stand, here in NZ we’ve yet to get to first base. In that the i30 is here – but not yet for sale. The car on test has NZ registration and was driven on NZ roads. But it is still undergoing evaluation and at time of writing had yet to be signed off for sale. Hyundai NZ says that will happen soon. Soon can’t come soon enough. It’ll be niche, of course. With cars such as these, the emotional buy-in is always much greater than the actual customer investment. On top of that, it likely as not will alienate through only coming with a manual transmission. But, yeah, dammit, they should sell it. Don’t sweat that the stated 0-100kmh time of 6.1 seconds is not best in class. Nor that this 1998cc turbo petrol four-cylinder hasn’t the MOST punch – though 202kW, at a heady 6000rpm, ain’t bad. The real attraction with this engine is the torque; 353Nm at 1450-4700rpm peaking at 378Nm on overboost. Among all relevant local market rivals, just the Honda Civic R and Megane RS deliver more. And it revs like there is no tomorrow. A fuel-cut function means it will happily bounce off its 6700rpm redline. The engine is no wallflower in respect to its soundtrack, either. Kicking into life with huge barking feistiness then settling into a burbling idle, it lends no chance of a quiet getaway. And that’s just in the standard driving mode. Go into the extreme setting – easiest accessed by pressing the ‘N’ button on the steering - and it entertains with evil pops and crackles on the overrun. That’s also when it drinks hardest of course; though, on that matter, it doesn’t particularly seem truly nasty. On the other hand, the factory experts who cite this model as being capable of achieving an optimum 8.0 litres per 100km are probably also folk who swear the Earth is flat. Assuming Hyundai NZ sticks to a previously stated plan to deliver just the highest-end format to market, you can expect the N to provide more standard equipment than its competitors, though mostly in the form of stuff that actually makes a difference. This isn’t just a case of finding some flash wheels, a few stickers and delivering it in a bespoke hero colour (which, if you didn’t tweak, is the same base hue featuring on the works WRC rally car). A dual-mode electronically-actuated mechanical differential is a decent treat not wholly available across this category. Beyond that it is a whole lot more serious top-shelf, money-no-object stuff. It has a high-capacity rack-mounted steering motor, switchable rev-matching function, short-stroke clutch, active aerodynamics and brake cooling ducts. There’s also a lowered front and multi-link rear suspension system with adaptive dampers, and athletic 345mm front and 314mm rear disc rotors clamped by meaty performance calipers; not the usual Brembo imports but Hyundai’s own, painted red just as the WRC cars’ are. The 19-inch alloy wheels are wrapped in bespoke (hence the HN designation) Pirelli P Zero tyres as standard. There’s facility to personalise the engine, rev-matching, launch control, suspension, steering, differential, stability control and exhaust sound settings through a total of 1944 possible combinations. Your favourite can even be saved for later access. Maybe you’re thinking the N is more race than road. It’s not, but it is very racy for the road. Even in its most comfortable settings, it does feel much harder and far more on edge than any regular i30. And, yeah, turning every dial to extreme and does somewhat reinforce the brand’s point about those placements being best reserved for race tracks. Suspension yield minimises to the point of lumpiness, the engine sounds louder and feels just that little bit more boisterous and throttle and brake sensitivity increases. If passengers complain, try re-setting the dampers in their softest setting and leave all else in their sharpest. If they still say it’s too feral … well, best invite them to walk. Because, c’mon, it’s a hot hatch, right? What I would say about the car is it’s not ruinously flavoured; Biermann’s blokes have got everything about just right and nailed the dynamic element particularly well. It delivers an impressive level precision and intuitiveness that is well above the norm. The response to all your inputs is just so perfect you feel you can place it safely and precisely and revel in the experience. Hyundai builds good cars, no question, but this one … well, in my experience, they’ve never previously had anything like it. What to improve? The i30 is a tidy-looking but innocuous car in standard form … and by and large, even with some aero adornments, the lowered ride and those large rims and those 235/35 R19 tyres, the N retains a touch too much of that element. Of course, some might say it’s an advantage for something evil at heart to look so innocent. I’d say the bigger drawback is that it comes only with a pure manual gearbox. I love those, but you cannot deny that most customers won’t so much. The fact that 90 percent of Golf GTi buyers prefer DSG should not be lost on Hyundai. They have their own direct shift box, of course, and talk is that the i30 N will take it. The sooner it does, the brighter the sales prospects. The interior could also do with a bit more work. Sports seats – sensational, by the way, even though they’re in-house rather than imported from Recaro - and a chunkier steering wheel aside, there’s not a massive amount of change. That big LCD infotainment screen is an upmarket element, yes, but one that fails to distract from the utilitarianism around it. Banishing those hard, scratchy plastics is job one for the facelift. So much has been written about this model that it’s possible that you think there’s nothing fresh to be said. Or discovered. But here’s something I didn’t know until recently, so maybe you didn’t either: An admission from the maker that this is the first car it has ever put into production knowing it might not make a profit. You sense it might, all the same, because at the moment Stinger is achieving very decent sales, mostly of the top dog $69,990 GT edition on test. For sure, the Koreans have lucked in on a perfect storm scenario. With the large Aussie cars having left the planet, and Chrysler’s 300C now being reduced to simply the V8 SRT edition, those looking for a bucket-load of six-cylinder oomph in a rear-drive package with room for a family will naturally steer to the Stinger because it is basically all you can buy now in the sub-$80k sector. At the same token, I’d also suggest that what you are buying into isn’t quite like what you used to be able to get. The now defunct Holden Commodore SV6 in particular is a car that many say this model usurps, but I think that comparison stands better when made on paper than on the road. The Holden was pretty out there from push of the start button; you never in any doubt about what it was going to give you. 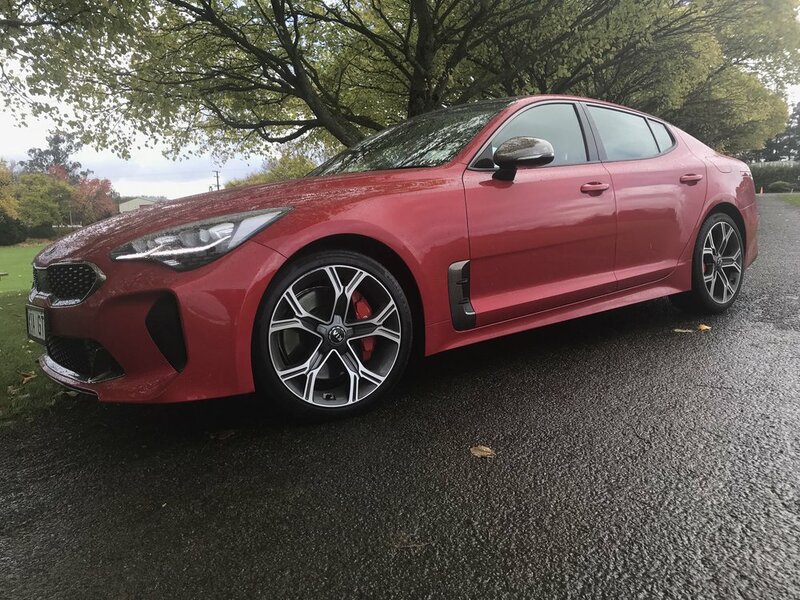 The Stinger, on the other hand, is more subtle; even though it certainly has the goods, not least in respect to performance – that 3.3-litre twin-turbo 272kW/510Nm V6 is a fine engine – it does not assert its character with the same degree of forcefulness and immediacy as the Kiwi favourite VF2. 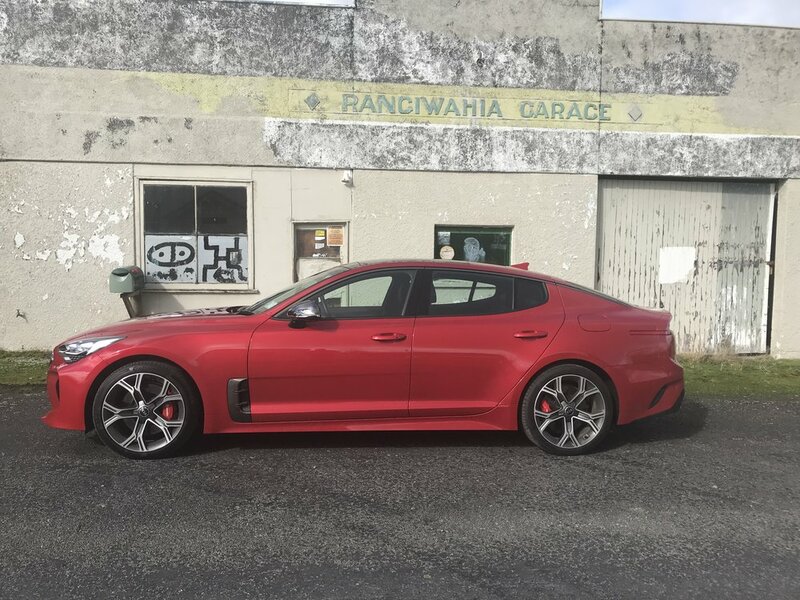 The Stinger’s development stoy is somewhat different to the Holden’s; there’s no Bathurst bravura in the Kia story. Gregory Guillaume, the French designer responsible for Stinger and the design study that spawned it, would be forgiven for looking confused if asked if Falcadores or performance Chryslers were his muse. He’s said he drew inspiration from European GTs of the 1970s, a different breed altogether. That approach probably pigeonholes it a bit, but really what makes Stinger stand out is that it is coming in when the rest are pulling out. The passenger car segment is shrinking and not category has shrunk as much, or as quickly, as the large car sector. It’s rapidly being eaten up by our insatiable appetite for SUVs. Anyway, it’s here and it’s selling, so there’s clearly enough of an audience to make it worth having. For all that, the first sense of sitting in this GT is that it struggles to make itself worth the money being asked. Admittedly, you won’t have this impression from looking at the exterior. Hiring former Audi head of design Peter Schreyer was a stroke of brilliance for Kia; every new car it has produced under his watch has looked pretty good. Being so low slung and long accentuates the Stinger’s handsomeness and, I’d have to say, the brilliant metallic red of the test car also has to be a particularly good choice; though metallic grey also works well for it. The styling is a bit fussy in places – there’s no practical reason for those big vents behind the front wheels – and, during my time with the car, some expressed thought that it could be a shape that might date relatively quickly, as the 300C did. Still, for now, it looks a million dollars. The same cannot be said for the interior. Yes, a lot of it is swathed in leather, the dashboard is all soft-touch materials and gloss black and stainless steel accents and you get a tablet-esque touch screen. But though there are hints of Audi in the general look of the design appearance, it doesn’t look as expensive as it should. Material quality is certainly not at premium German level. It struggles, in fact, to meet mainstream German: You only need look to a Skoda or Volkswagen for this money to see how much better the Koreans should be doing. What particularly lets the Stinger down is that there are too many hard, shiny plastics. Also grating is the cheap-looking secondary switch gear, which seems to have come from the same bin of from which bits for the budget-minded Rio are pulled. The leather isn’t of great quality; some of it isn’t actually leather. The touchscreen graphics are also a bit dated. Even the steering wheel – also proliferated with chintzy toggles - doesn’t feel quite right. All in all, you get neat and practical but not enough pizzazz. Perhaps the next consignment of Germans should be those with backgrounds in interior design. It’s a pity the presentation didn’t get more polish because the fundamentals of this environment, in respect to the occupant placement, is not too bad. Settling in behind the wheel enhances impression of the model’s sportiness, simply you sit quite low; just as you would in a BMW or Audi. The shallow glasshouse does not impact on forward and side visibility, but the modest view out the back window and the slabby c-pillar will be cursed when you’re reversing out of an angle park. Thankfully the model features blind-spot monitoring, a camera and well-positioned wing mirrors. Unsurprisingly the swooping roof line means back seat head room isn’t brilliant for tall types – I’m 1.8 metres’ and my head was touching the roof lining – and even though the long wheel base (and the backs of the front seats being scalloped) means there’s quite good lower leg room, those with big feet will need the co-operation of front seat occupants to raise their seat bases slightly. Although it fills a parking space as well width-wise as it does for length, the cabin is not as wide as that of the new Commodore (arguably now a medium car) let alone the old one. The shape of the bench makes it better for two occupants than three. The specification is generous: The front seats are electrically-adjusted and not only heated but cooled and there’s dual-zone climate control (with physical dials and buttons), sat nav and a Qi wireless charging pad, though because you still need to cable in your phone to use the Apple CarPlay and Android Auto connectivity you cannot use it as effectively as you could if those App connections were by Bluetooth, as occurs in BMWs now. There are more than enough power and USB outlets. This edition takes a full suite of active safety, including lane keeping assist, blind spot monitoring, rear cross traffic alert, driver attention alert, active bonnet, front and rear parking sensors, rear camera, 360-degree camera, and autonomous emergency braking, airbags, traction and stability controls, and a limited slip differential. The long, wide but shallow boot is accessed via a liftback that is powered and will self-open if it detects the key in close proximity for three seconds. The rear seats are 60:40 split fold meaning you can expand the boot to 1114 litres if needed. So, basically, there’s enough here to see it stand good chance of serving as a family car (though perhaps not as a taxi). Yet that’s not what’s going to ‘sell’ it, of course. An engine this grunty, an eight-speed gearbox, a chassis finetuned by a German behind some of the best M-cars ever … well, you’d have to say the Stinger has all the right stuff to be something really special, right? 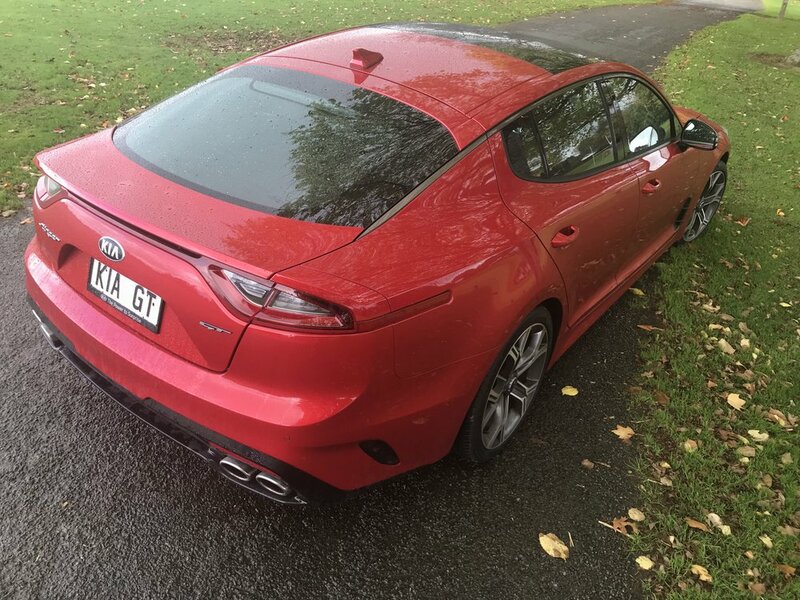 Ability to hit 100kmh from rest in just 4.9 seconds, if you use launch control, makes it not only the fastest-accelerating production Kia ever but quicker than some none-premium V8 rear-drive sedans. There’s definitely sting. And, yet it’s not a car that crows loudly about its abilities. In fact, if you’d didn’t it could be driven hard with confidence, you might not think it should. First, look at the different engine and modes. Yes, you get Sport and Sport Plus – which is basically the first without traction control – but there’s also Smart, Eco and Comfort. None of which sound all that performance-themed. The first definitely aren’t; indeed, if you want to feel the burn, those settings are going to gather dust, cos they make it feel sluggish and uninteresting. Second, listen to the exhaust note. Actually, strain to listen. It just lacks anything musical, for the main part. Even in the extreme modes, it is barely burbly. None of the excitement you get out of the i30 N, that’s for sure. Another factor that makes you wonder if it’s as up to snuff as they say is the weight. At 1780kg, the Stinger isn’t light by any means. So it can be soft, too quiet and is potentially too fat … and yet, when you get it away from the city, where it likes to schlep around quietly, and onto an interesting road, then open the taps .... well, it gets real serious, real fast. It’s remarkable how the speedo suddenly seems to read off the count in 20kmh chunks. Like, 100kmh is suddenly a lot quicker without any particular right foot flex. The engine’s smoothness maintains when it revs out, but it’s a shame always sounds like a big vacuum cleaner, all turbo whoosh, but no meatiness. There’s a trick to driving it quick: Put the gearbox, the steering and the engine in Sport but think twice about doing so with the suspension, at least on secondary roads. The pre-sets of those electronically-adjustable dampers are not quite right, I feel. The firmest setting was just too brittle over some country roads; not just for my own comfort but also the car’s. You enter a corner and it would often not settle, but instead pitch and kick; disconcertingly so over mid-bend bumps. Going back to Comfort, resolved this nastiness straight away and, on this day, made it easier to drive faster. Relaxing the traction control allows the tail to move about with a lovely sense of control. The gearbox gets playful, too, though it is annoying that the manual mode isn’t as advertised: Even when you think you have control with the paddle shifts, it’s a ruse. The box will still self-change up and is resistant to changing down if it thinks it shouldn’t. That diminishes the fun. Pinned back to steady cruise on the highway and the Stinger feels like a different car, if also less remarkable. But that’s probably a plus side to its character for those who will want it foremost as a long-distance cruiser. The Eco and Smart modes, though, aren’t useful unless you have the needle in the red and need to eke out economy. It’ll lean down but sometimes to the point of feeling too lazy. Both cars are hugely impressive but I’d had to say there was just one I simply never tired of driving and disliked having to give back: The Hyundai. That’s not to dismiss the Stinger; it’s certainly also deserving of attention. Yet, at the same token, it was simply not as easy to come to terms with or, in fact, reconcile its place in the overall scheme of things. 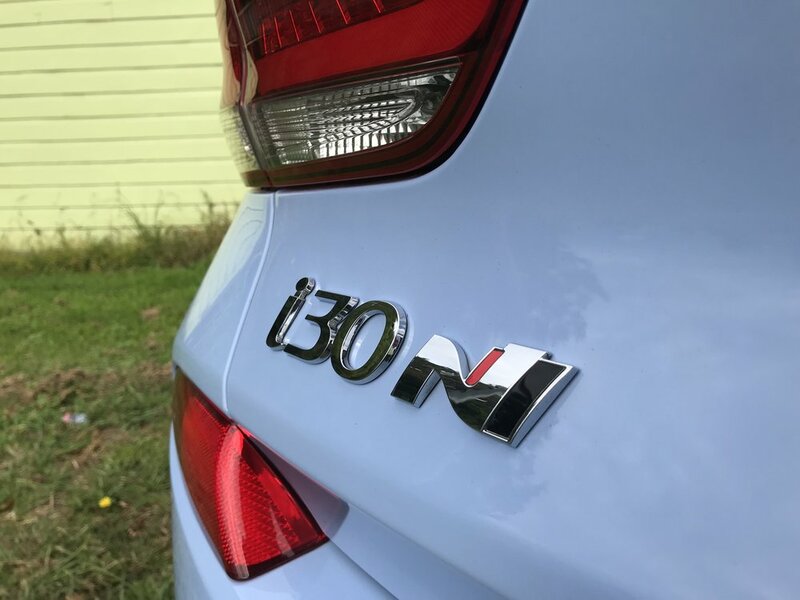 With the i30 N, you get a hot hatch, pure and simple. The Stinger, by contrast, starts off with several personalities and isn’t so immediately open at divulging its true self. Also, though each product could be further improved, you could at least live with the i30 just as it is right now, whereas the Kia just isn’t quite there yet. Though there’s nothing that couldn’t be easily remedied: A more strident exhaust note, some extra effort in the interior and a touch of suspension recalibration would do the job. Either way, these cars are stunning achievements that do their maker proud.